In order for you to receive years of enjoyment and service from your sectional building it is important that you ensure that the site is not prone to regular flooding and that you prepare the site for your building properly. Base preparation need not be an elaborate work of art, so long as the end result is an area of ground that is square, level and firm. We recommend that you use either of the following methods. Your new building can be erected directly on to a concrete base, or a slabbed area as described above. When laying concrete slabs it is important to ensure that the slabs are laid on to firm sub-soil topped with sand, gravel or a dry mix of sand and cement, making sure, by use of a spirit level, that the slabs are level. Floor bearers are lengths of treated timber, measuring 3" x 3", which are laid under our floor joist in the opposite direction. It is important to ensure that all vegetation and turf, etc is removed from the site, ensuring that the bearers are laid down on firm ground and are level with each other by use of a spirit level. Floor bearers should be of sufficient length to fit under the floor joists, laid on at each end, and then at approximately 16" to 19" centres. 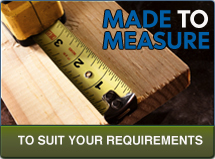 This will give sufficient support to the floor joists and ensure that your building will be a stable construction. Apex click here to view diagrams. With an apex shed there is a choice of door and window positions. 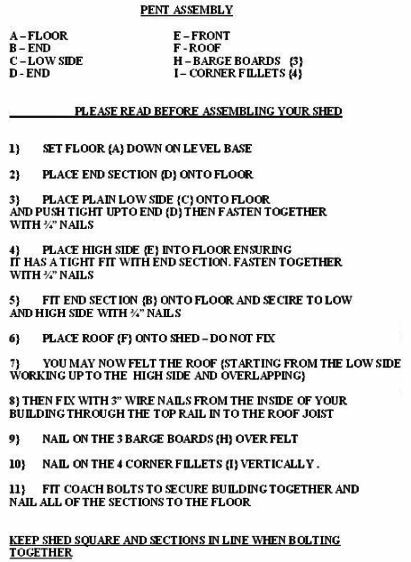 The door can be positioned at either end, and the window on either the left or the right hand side of the shed. Doors are hinged on the right as standard but can also be hinged on the left at NO extra charge. 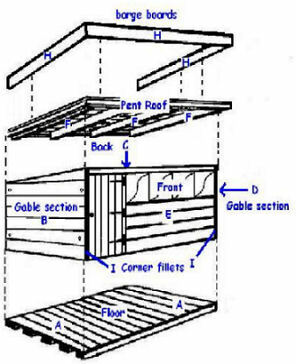 The door on a pent style shed can be positioned either side of the shed or the front section. They can be hung left or right handed. The size of the door is dependent on where it is positioned and the number of windows required. 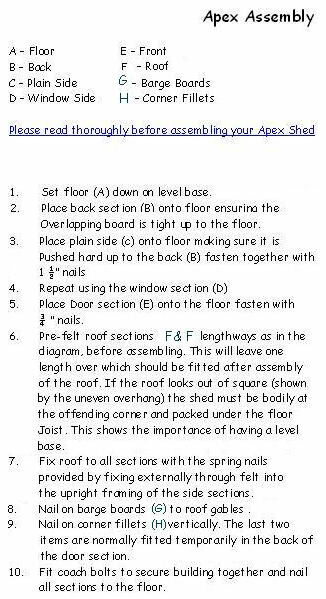 This will of course have a bearing on where you have your windows placed, see proposed door positions on the illustrations below. 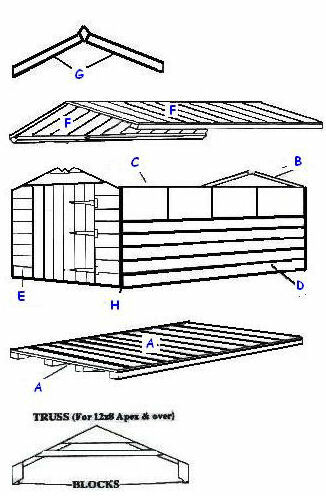 When ordering a pent style shed could you please quote the style letter configuration you require click here to view diagrams.